But in the robocar era, is it really a good idea? Is the $1.58 billion to run 1.7 miles of light-capacity rail a wise choice? Do other subway projects underway make any more sense? New York's 2nd avenue subway cost over $2.5B per mile. The central subway consists of 2 20-foot wide round tunnels. They cost a lot ($234M) but most of the cost is actually the complex and deep stations and other associated costs. There are much cheaper ways to make dedicated right-of-way. Dig and cover (which disrupts streets) can be much less, and elevated guideway can be in the range of $100M per mile. I personally feel we won't need to dig many tunnels in the future because computer metered road-use should be able to eliminate a lot of congestion and, combined with other factors, cause a serious capacity increase. But in cases where the only answer is to build extra dedicated capacity, trains may very much be the wrong answer. It's tight, but I think a 20' tunnel could carry 4 lanes of robotic cars and vans that fit in a 6' by 6' square, and certainly 3 lanes -- 2 below and one above. 3 lanes of 12 seat vans on a one second headway would carry about 130,000 people per hour in each direction, if you wanted to buy that many vans. The subway is hoped to carry 35,100 people per day by 2030. Not so many vans are needed. If an average speed of 30mph is attained (which is more than the trains get) each van would take 12 minutes to complete the circuit, so a bit over 1200 vans would saturate 3 tunnels, hardly needing all 3 lanes. You would not actually build so many vans since you don't need anywhere near this capacity. A van based transit system would not run like a train. Rather, each van would collect riders all going between the same two stops as long as the stops have decent ridership. You would get in your van at stop A in an offline parking location -- unlike trains, cars and vans would not block the main tunnels. Joining you in the van would be other passengers also going to your stop. The van would then enter the traffic flow and take all the passengers non-stop to their destination stop, as fast as they can safely travel in the tunnel. A huge savings would come from not having traditional stations. 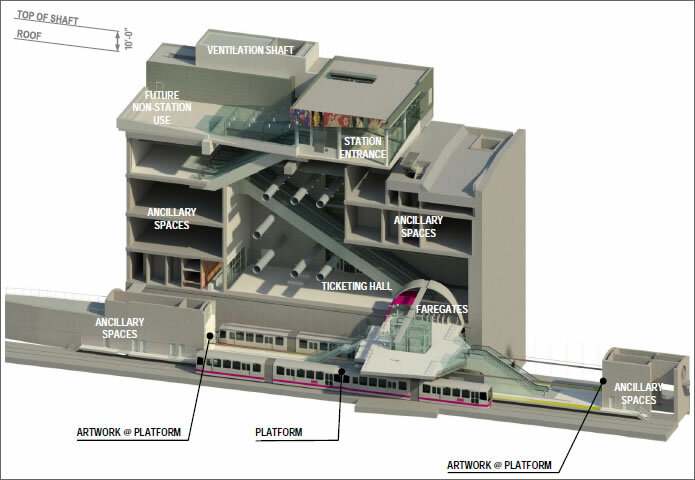 Look at this proposed diagram for the Chinatown station. It's a massive 9 storey building underground, and will feature a fairly long trek up and down the escalators from street level. No wonder the stations cost hundreds of millions of dollars. The "station" for a robovan tunnel would simply be a widening of the tunnel to access on-ramps and off-ramps that build bring vehicles to the surface or near it, exiting in one model to former above ground parking garages. Such garages will already exist (and be used much less for parking in the robocar world) so their cost will be minimal, but even building them is not that expensive because they are above ground. Vans which exit the tunnel would climb to the parking level, which would be at ground level or perhaps even the 2nd storey, above shops and building entrances. They would have slowed and would pull into an assigned parking spot, where passengers would be waiting. The van would exchange for its new passengers, and then descend back to enter the flow via an on-ramp tunnel. Passengers would find this nice as well, since they would enter and exit at ground level, not taking a long trek down the escalators. While you must ventilate the tunnels, you do not need to build giant underground spaces and give them ventilation and climate control. Of course, the parking lot boarding station actually represents old-school transit thinking. In reality, most of the vehicles would exit the tunnel onto the surface streets, taking their passengers not to stations, but to their actual destinations within short range of of the exit ramp, or anywhere beyond the end of the tunnel. Likewise, most vehicles would be gathering passengers from these remote places and zooming them into the tunnel when they reach it. Only people who really want to go a short walk from the station would board there. The rest would ideally use single person half-width robotaxis that got them to the "station" on surface streets, and dropped them right at their boarding spot. The most challenging element in some locations would be getting from ground level to just below ground. The problem is this space is often occupied with building basements and conduits. The water table may also be there. This may make it hard for a ramp to rise gradually towards the boarding lot. At 6% grade, rising 25' will take 150'. Fortunately, vehicles don't have to move quickly at this interface. Down below, where they merge with the tunnel, they must match the speed of traffic they are joining. This lower speed means tighter turns are possible. In some cases, it will be possible to find a building with a deep basement, and place the boarding spots there. This does not allow easy exit to the street and passengers must take an elevator/escalator to it. Under the street can be a good place to do this, but it requires street closure for a time. Spiral ramps are possible to climb in a small space, but only at low speed, and with some discomfort. They are common in parking lots. Elevators for vans can work in a very small space. In order to get suitable flow, one could consider the Paternoster elevator design. It's not viewed as safe for humans but robots could negotiate it. There would need to be ramps at the entrances of the platforms to make a smooth transition to a rising of descending platform. Hitachi has a design that does not need this which is more complex. Or just a higher volume of traditional elevators. Vans in a tunnel get a marvelous benefit when they stop. Since they are going uphill, they don't need to brake much. Designed just right, they would not really need to brake at all. This stores all their energy in gravitational potential and will accelerate them back down into the tunnel. In addition, passengers will feel far less force forward or backward from the acceleration -- most force will be up or down. Not that this matters as much, since the trips are non-stop and they are probably seated. The system is also much more energy efficient than the trains. While steel on steel does have less friction than the rubber tires of the vans, and a packed full train is more efficient than a set of vans, you simply don't run most of the vans when the system is at low capacity. Trains, unfortunately, are very inefficient off-peak when they run largely empty. At very low usage times, you may decide to have some of the vans make multiple stops in order to keep frequency of service up. In this case they would use the premium docking spot in the boarding lot so the stops take as little time as possible. Would you have a tunnel? With this design in mind, you probably would never have built something like the 20 foot tunnels the light rail trains need. 3 lanes each way is overkill, and a single lane tunnel, perhaps 9 feet in diameter would do the trick. This turns out to be a really big saving. Many will have heard of Elon Musk's tunnel plan called "The Boring Company." Their main realization is that the cost of tunnels goes up with the square, or even more, of the diameter. The 9' tunnel perhaps costs 1/4, or even less, of what the 20' one does. If you made custom vehicles that fit in a 6' tunnel the tunnel can cost one tenth as much to dig. That's with existing technology -- The Boring Company hopes to also improve the efficiency of tunneling machines even further, and there is reason to be optimistic. Boring a tunnel has its advantages -- you can do it in dense urban areas with no disruption of the city, either during or after, and tunnels can cross one another at different levels. Still, some other methods like dig and cover may make more sense for simple tunnels, because you don't need to close the road for that long. Another option is elevated routes. If the only vehicles allowed on the elevated paths are lightweight vans, you can make these cheap and small, so that they don't disrupt the visual space very much. Unlike robocars that do go on the streets, it's much easier to make ones that can handle a dedicated track. These vans would be smooth and electric, using a combination of batteries and electricity drawn from an electric rail or overhead wire in the tunnels. (The batteries would handle operation in the boarding lot or on surface streets.) With the excess capacity, the vans would probably have a seat for all passengers -- even assigned seats -- but to save money there could also be vans with lots of standing room for rush hour. I will go so far as to say that if the Central Subway is not going to open until 2021, even though it has already been bored, and track has been lain, and stations are partially built, it might be just on the cusp of having been a giant waste of money compared to this alternative. The alternative would deliver vastly more capacity at lower cost, with non-stop service right from surface point to surface point at higher speeds and greater convenience. The 1,000 vans able to keep the tunnels at the immense over-capacity described would cost perhaps $40-50M, probably less than the rolling stock of the light rail. Unfortunately, for a conversion, the main station at Embarcadero where the line will meet both the main Market street Muni line and BART is probably the hardest thing to handle. An ideal situation would be to have near-surface boarding points (parking lots at Union Square, Ellis/O-Farrell and 5th/Mission would do OK) and a path directly to the BART and Muni platforms. These are not really designed for that, though. Since everybody in a van would be doing the same transfer, the processing of tickets for those lines could be done online or in the van, allowing passengers to travel right to the train platform if there were a physical way to get them in. Even so, it's clear that a "just tunnels, ramps and loading lots" design would be vastly cheaper than the traditional design, and would still be a lot cheaper even with the traditional building already underway. This particular subway is an odd choice because light capacity rail is light capacity; it's very hard to justify the immense costs of a subway for it today. But since the other Muni lines, particularly the T-third this will join to, are light capacity rail, this is how they went. Automation phobia caused by BART? Neither the Wikipedia page or the SFMTA web site gives any details about the train control systems, but I'm assuming they will be something like standard rail fixed block signaling, with operators manually operating the trains. Do you think the failure of BART's early promises of high automation has spooked other transit systems away from considering the high level of automation that would be required by your proposal? I think the biggest factor is the intention to make this a continuation of the T-third line, which is light capacity rail (street car.) In fact, the "central subway" runs on the surface from the Caltrain station, through its first stop and then dives underground at highway 80. The heaviest use will be between Caltrain and Chinatown, the new section. So they just naturally presume it needs to be done with old-school street car technology, and whatever train control they use for that. Since those trains run at-grade they are giving them operators etc. So probably not that much to do with BART. It is of course bizarre. Here we are, ready to deploy automated vehicles on city streets mixed with cars, peds, bikes and more, and we're still afraid of automated trains on dedicated track. Of course trains are much, much, much, much more kinetic energy. But, hey, I'm totally with you on the subway topic! I've been saying that if we rip up tons of existing infrastructure and replace it with an idealized environment for autonomous driving, expensive as that would be we would do ourselves a huge favor. I too have been puzzled by how trains still need drivers. Clearly rails are not the compelling technology they once were if simple computer programs can steer perfectly (it's the reacting to mixed use madness, i.e. people, that's the tricky part). it might be a good precedent to send our high energy transportation underground where it doesn't kill people willy nilly. I'm delighted to see some creative thinking beyond building a car that's more human than human. I am still not a fan of extra infrastructure, but this does not mean there are not some exceptions. The Central Subway tunnel is already dug, so I want it to be used to the best efficiency. I believe we can solve our problems on the surface at a much lower cost, but not instantly. Until we do, tunnels can make sense. As Elon Musk lights to point out they don't disturb anybody and can take direct paths, and can be at different levels so they don't need to cross at intersections. But they are still quite expensive. Yes, you can use single bore with crossovers though that means quite a drop in capacity. The big problem with that (and roundabouts) is that roundabouts can be jarring to passengers if taken at speed, as would be quick turns at wide spots. I do definitely support the idea of making single lane roads for low-traffic paths on the surface. It is very efficient. You don't need roundabouts in tunnels because they don't cross one another at the same level. Indeed, thanks to that you don't need cloverleafs either. Obviously some people in history thought that massive infrastructure projects would make sense. We can disagree on whether that's true for autonomous vehicles, but I'm delighted we can agree on the fact that if a suboptimal massive infrastructure project has already been mostly completed, we can use autonomous vehicles to make it better. I'm not sure I understand why roundabouts wouldn't be effective. Sure they don't need to intersect at all (skew) and with no extra cost (unlike surface bridges that do the same). However, the real point of roundabouts underground would be to provide route flexibility that trains simply can not match. Imagine a 100m diameter roundabout with 8 branches for example. Instead of being jarring for passengers, I'd say they'd be ok if the path planning was sensible. It's a lot easier to modulate the speed of a vehicle like we're talking about than a train. Certainly the passengers' desire for smoothness could be optimally balanced with their desire to get where they want to go ASAP. They seem a smoother alternative to actual turnoffs which could also be done perfectly well underground but which trains can't do (very similar to your notion that conventional stations are not necessary). I think the main thing we agree on is that the case for rails is much weaker than it formerly was. In the past the rails could steer the train but now that is completely superfluous. All the problems that autonomous cars have (liability, dealing with other vehicles, a certain degree of human inattention) are all problems trains have solved. Sure they solved them using expensive dedicated infrastructure, but I see that as an inspiration for an incremental improvement before the super intelligent cars that will be necessary to compete on the same roads as human drivers. What advantage does the roundabout offer? Why do you want to mix the traffic of the two intersecting tunnels? Why would you not just have the tunnels cross, one over the other, and have the 8 corresponding ramps allow transfer in all the directions needed. That has a cost in tunneling of course, as does a wide enough roundabout, but these tunnel connector ramps are almost all single vehicle, and that's vastly cheaper than a tunnel with 3-4 lanes in it as a roundabout section would be. Plus, intersections are probably good places to have tunnels to the surface which can be partly shared with connector tunnels for better cost. Entry to a roundabout tends to involve two quick turns. ie. (in the US) a right turn to enter the roundabout, and then a left turn to adopt its curvature. So you jostle passengers both ways side to side. In addition, you want to bank all turns and you can't bank a left-right, but you can properly bank the turns of a connector.